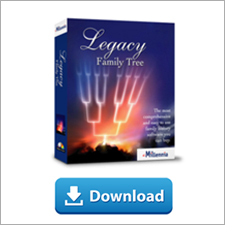 Every Friday we're pleased to offer Legacy Family Tree Webinar subscribers a new bonus webinar just for them! This Friday enjoy "Where did you come from, Missouri Settlers?" by Beth Foulk. If you're not a member, remember the webinar previews are always free. Beth discovered her love of genealogy through her father, who built a 115-name family tree with every family member's name he knew. While Beth continues to research her family, she shares her knowledge through lectures, articles, her blog, and one-on-one assistance. She particularly enjoys speaking at regional conferences. Her focus is Early American Genealogy. See all the webinars by Beth Foulk in the Legacy library. 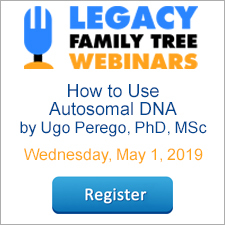 The recording of today's webinar, "The YDNA Test Should Be Your Favorite” by Diahan Southard is now available to view at www.FamilyTreeWebinars.com for free for a limited time. The Y chromosome DNA, with its direct paternal line inheritance pattern, is a powerful tool for any genealogist, male or female, seeking to extend or verify a genealogical line. This lecture will cover basic and intermediate principles of using YDNA verify and extend your pedigree chart. If you could not make it to the live event or just want to watch it again, the 1 hour 30 minute recording of "The YDNA Test Should Be Your Favorite” is now available to view in our webinar library for free for a limited time. Or watch it at your convenience with an annual or monthly webinar membership. Join us and Diahan Southard for the live webinar Wednesday, August 29, 2018 at 2pm Eastern U.S. Register today to reserve your virtual seat. Registration is free but space is limited to the first 1,000 people to join that day. When you join, if you receive a message that the webinar is full, you know we've reached the 1,000 limit, so we invite you to view the recording which should be published to the webinar archives within an hour or two of the event's conclusion. So far we have learned how to Link to Parents and how to Link to a Single Parent. Today I will show you how to link to two sets of parents. Gala Apple was adopted. Her adoptive parents are Mcintosh Apple and Cotton Candy. Through DNA Gala has found her biological parents. To add her biological parents you can either click the blue + (plus) sign in the parents' area or click the Parents icon in the row of icons under Gala. Notice that on the Parents icon there is a little number 1. That tells you that Gala has one set of parents. When we get done that will change to a 2. When you use either method this is the dialog box that you will see. Since we have the adoptive parents already highlighted and ready to go we will work with them first. At the bottom you will see Relationship to Father and Relationship to Mother. We will use these to designate Gala's relationship to this set of parents. Highlight the Unknown & Unknown Parents and then click Edit Father. You will see a now familiar dialog box giving you the option of Add a NEW Person or Link to an EXISTING person. We were already given the opportunity to Link to Existing Parents but we didn't choose that option before so why are we presented with this question again? You would select the previous Link to Existing Parents option IF both people are already in your file AND they are already linked to each other as a couple. You would use this Link to EXISTING Person IF the father is in your database AND the mother isn't OR the mother is in your database but not linked to this father yet. We are going to Add a NEW Person so go ahead and click that button. The Individual's Information screen comes up. Notice that the surname Apple defaulted in. We will need to change that. If we didn't know the child's other biological parent we could stop here but we will go ahead and highlight Cheddar Cheese and now click Add Mother. Did you notice that the button Add Father is now changed to Edit Father? After we click Add Mother we get a slightly different dialog box. Don't let the Add Wife to: throw you off. You are merely linking the two parents together. If they were not married you can easily mark them as such in just a minute. We are again presented with two options. We are going to Add a NEW Person. I would use the Link to an EXISTING Person IF I had added the first parent as a new person AND now I am going to link that new person to an existing one in my file OR both parents were already in my file but they were not linked to each other as a couple. Legacy will link those two existing persons as a couple. Remember, if both persons are already in your file and they are already linked to each other, you would have used the option at the very beginning to Link to Parents. So now I am going to add Gala's biological mother. After you click SAVE the Marriage screen will pop up. Here is where you can mark the couple as not having been married if you need to. After you click Save you are back to the Parents screen and now you can see both sets of parents. Notice that I have Cheddar Cheese and Pasta Salad highlighted and I have marked their relationship as Biological. Also notice that I could mark these relationships as private or invisible if I needed to. If you go back to the Family View you will now see that the Parents icon has the number 2 and if you take your mouse and hover it over to the right of the Parents area you will see a bar appear that you can click to easily switch between the sets of parents. I want to go back to the Parents screen for a sec to point out something. You can mark either set of parents as Preferred. All that means is that when you are navigating through your file this is the set of parents that will be displayed in the various views. You can easily switch to the other set like I showed you in the last screenshot. This will also be the set of parents that is displayed in reports. Some reports allow you to show both sets of parents. In the screenshot you will see that Cheddar Cheese and Pasta Salad are showing as Preferred (asterisk * by their name). To change which couple is preferred, highlight the couple that you want to be preferred and then click Select. This dialog box will disappear but the change has been made. Open up the dialog box again and you will see that Mcintosh Apple and Cotton Candy now have the asterisk (*) and are the preferred parents. Before I close out this article there are two situations I want to address. If the child was adopted by a close relative you don't want to give them two sets of parents (for example, if the child was adopted by his grandparents). If you do, you will create an Endless Loop that will cause you problems when doing reports. Instead, just leave them with their biological parents and explain the adoption in the notes or create an adoption event. The other situation has to do with step-parents. Ancestor and Descendant reports and charts are based on bloodlines. People write in all the time asking how they can get their stepchildren to display in their bloodline reports. If you want to include non blood relations you have to trick Legacy a bit by giving these children two sets of parents, their biological parents and their biological parent plus the step-parent. You will need to designate the step-parent in the Child-Parent Relationship. I highly recommend that you leave the relationships blank for the biological parents and only designate the step-parent. I only mark the biological relationships in a non family member adoption. This will keep your reports from being cluttered up with labels. In the below screenshot you can see that Gala's mother Cotton Candy was married twice. Gala's relationship to Cotton's second husband, Sliced Bread, is Step. When you create a report you will need to select the option to include the Child-Parent Relationships. Open the report you are working with and then click Report Options. Make sure you are on the Include tab. About halfway down the left column put a check mark in the box that says Child-Parent relationships. If you don't, whoever reads your reports will get confused since reports are designed to show bloodlines. You will have children that appear to have been born out of wedlock (before or after the couple married). This is especially true if the mother is the step-parent and the father had children from a previous marriage. All the kids will have the same surname and it will appear that the couple had children outside of the confines of their marriage. If the wife is the one that was married more than one time you will have children with different surnames which will not readily make sense since the wife's previous marriage(s) will not be displayed. I hope this series of three articles, Linking to Parents, Linking to a Single Parent, and now Linking to Two Sets of Parents will help you document your relationships correctly. Join us and MyHeritage's Daniel Horowitz for the live webinar Tuesday, August 28, 2018 at 2pm Eastern U.S. Register today to reserve your virtual seat. Registration is free but space is limited to the first 1,000 people to join that day. When you join, if you receive a message that the webinar is full, you know we've reached the 1,000 limit, so we invite you to view the recording which should be published to the webinar archives within an hour or two of the event's conclusion. MyHeritage Chief Genealogist, Daniel Horowitz provides key contributions in the product development, customer support and public affairs areas. He holds board level positions at the Israel Genealogy Research Association (IGRA) and the International Association of Jewish Genealogical Societies (IAJGS) among others. Daniel was the teacher and study guide editor for 15 years, of the family history project "Searching for My Roots" in Venezuela. In June 2015 we formed the Legacy User Group on Facebook. At the time we were a bit unsure if users would even be interested in something like this but the group has EXPLODED! We now have over 18,000 members. Because there are so many members the administrators and the moderators have to be strict with limiting the discussions to Legacy, any of the add-on programs that work with Legacy, and any of the websites Legacy can directly access or sync to but only in regard to how they work with Legacy. We can't allow general genealogy questions or tips. So the question is, what groups are there on Facebook for these other topics? Here are my top ten favorite Facebook genealogy groups (not in any particular order). I am adding the group descriptions as they appear on Facebook. "Share your tips and tricks for organizing your genealogy. Links to products and services are acceptable. Let's all work together to get better organized!" "Discussion of technology used for genealogy purposes. Includes: software, apps, tablets, computers, gadgets, news, web sites. Topics must be related to technology and have applicability as a genealogy tool." "This group is all about Genealogy/Family History. A place to ask question about these topics. To share what you have found. The purpose of this group is to assist members in research ancestors - to learn about resources and techniques that will enhance that research." "Ethics and the Genealogist is a group with a diverse membership from the novice researcher to the advanced professional coming together to discuss ethical issues they encounter while researching." "This group provides assistance to others in the translation of their genealogical documents. Volunteers offer translation of genealogical documents including vital records, letters, obituaries, and more, in languages including – Dutch, French, German, Hungarian, Italian, Latin, Polish, Russian, Spanish, Swedish, plus others!" Genealogy Do-Over: Are you ready to hit the restart button? "Genealogy Do-Over - the educational initiative where you do get to go home again . . . and start over with your genealogy research." "This group is for all of the Genealogy related stuff that is considered off topic in other groups. Feel free to share your feelings, opinions, victories, defeats, and even vent if you need to." "Genetic Genealogy Tips & Techniques is a place to discuss topics in DNA ranging from beginner to advanced." "Genetic genealogy group focused on using DNA to find biological family for adoptees, foundlings, donor-conceived individuals, unknown paternity and all other types of unknown parentage cases - recent and more distant." There are also groups for every one of the different genealogy websites. Some are official groups sponsored by the companies themselves and there are some that are "unofficial" groups. For example, There is a MyHeritage Users Group (unofficial). Even though it is unofficial MyHeritage employees do monitor it and also interact with the users. Not enough options for you? Check out Katherine R. Willson's Genealogy on Facebook List. At the time of this article she had over 12,300 Genealogy Facebook groups listed. She updates it regularly. You can download it as a free PDF. There is a well-organized table of contents so it will be easy to find groups that will meet your specific research needs. All of the links are clickable. Keeping ALL of the Facebook groups on topic helps everyone. Every Friday we're pleased to offer Legacy Family Tree Webinar subscribers a new bonus webinar just for them! This Friday enjoy "Polish Communities - Migration and Resettlement" by Julie Goucher. If you're not a member, remember the webinar previews are always free. In this session we will look at the earliest Polish Communities in Great Britain leading up to why and how these communities were developing. We then explore the expansion of such communities in the period leading up to the Second World War, Poles in Russia and Persia and subsequently leading to the Resettlement Act of 1947 and then settlement in Britain and beyond. This presentation is accompanied by a handout detailing genealogical avenues for research. A family historian for more than 25 years, Julie started her interest into her roots early, encouraged by a series of Great Aunts. Julie's ancestry is primarily from the southeast of England; Surrey, Sussex and Hampshire and her roots are deeply embedded within those three counties. She also has links to Warwickshire and various other parts of the globe – India, Australia and Canada. Julie is half Italian and it was during her pursuit of this part of her ancestry that she formed both a one-name and one-place study. Julie has been a member of the Guild of One Name Studies for over 10 years and is currently secretary and is the former Secretary and founder member of the Society for One-Place Studies. Julie was a founding member of the Anglo Italian FHS and was vice-chair for around 5 years. Having worked within the Pharmacy management profession for over 20 years, a move to Devon was the catalyst to return to study and complete a history degree. Julie is the writer and developer of the successful "Book of Me, Written by You" program, which has been popular as a series of workshops delivered to both professionals and historians, in addition to undertaking research for some clients. Julie is a regular contributor to The In-Depth Genealogist magazine with her column Across the Pond. Julie's book Tracing your European Ancestors is to be published in 2016 by Pen and Sword Books. When Julie is not working or researching her own ancestry she can be found reading, exploring the many National Trust properties within the South of England or writing at her blog – Anglers Rest. See all the webinars by Julie Goucher in the Legacy library. The recording of today's webinar, "Researching Forces Ancestors (England and Wales)” by Kirsty Gray is now available to view at www.FamilyTreeWebinars.com for free for a limited time. Do you have a British ancestor who served as a soldier or sailor? This webinar will highlight the sources available over the last two centuries both online and offline, including researching at The National Archives (Kew), in local repositories and museums, to add flesh to the bones of your ancestor's service history. If you could not make it to the live event or just want to watch it again, the 1 hour 21 minute recording of "Researching Forces Ancestors (England and Wales)” is now available to view in our webinar library for free for a limited time. Or watch it at your convenience with an annual or monthly webinar membership.